It has been far too long since any new projects have been underway in the Ecclesiastical Sewing workroom. For tonight, we shall have a quite peek at a pastoral stole project. Often when a young pastor or priest is in the beginning stages of their career, they are not able to afford a set of clergy stoles. Or they may have been at a parish that has stoles, and never had the need for a set of their own – until they move on to a new parish. For a church, the same can be true. A pastor comes, and he has his own set of stoles, and so the parish does not worry about the items until a pastor leave. Taking the above scenarios one step further, one might have a pastor with no stoles, and a church with no stoles because of changes and the timing of moves. And such is the case at my home parish. So what might a solution be? Select a few simple design ideas, assemble a group of ladies (and gentlemen) and have a stole making party. The project begins with the above collection of stole quarters. What is a stole quarter you may be asking? For those who are quilters, you most likely are familiar with the term “fat quarters.” A fat quarter is a means of cutting fabric into a more usable piece, allowing for more variety with use, and minimizing waste. With the pastoral stoles, we can do the same thing. Rather than purchasing a 1.5 yard or 1.5 meter piece, the fabric is cut to a size large enough to use making a stole. What is a stole size piece of fabric you may be asking? The fabric would be 13 to 15 inches wide and around 60″ long. The idea is to purchase the size needed, and not to purchase an entire width of fabric for use in making one stole. So this is the start. 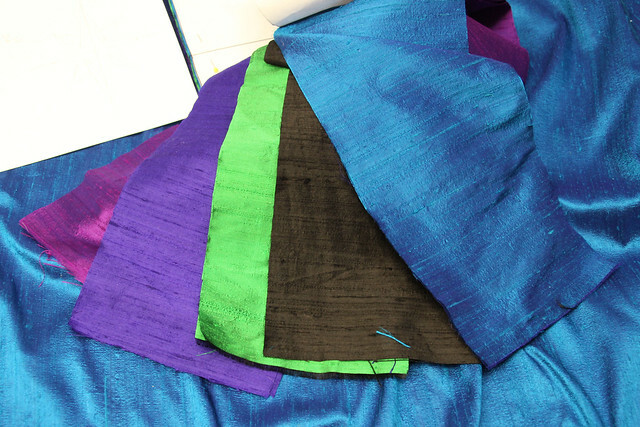 The colors are a lovely advent blue, black, green, purple, and violet silk dupioni. There are other colors, such as red, which is already complete, and white. But more on that later. For now, I must get back to work to meet the deadline of this project.